When the Lancashire County Library opened its first library centre in Ormskirk in 1926, it was housed in a room adjoining the old Fire Station in Derby Street, and opened for four hours a week. Borrowers visiting the library would see on the opposite side of the road a very fine example of Georgian architecture, Knowles House, and it is intriguing to note that on the site of this house, only a few yards, but 34 years away, from the place it began, the Ormskirk library came to its present home. Before that time, however, the library was moved in 1940 to converted shop premises at 42 Aughton Street, where the adult library was housed upstairs in the “front bedroom” and the children’s library In the “bark bedroom”. Although this move, with its much improved selection of books, was greatly appreciated by the readers of Ormskirk, some of whom will still remember with nostalgia the homely atmosphere of the adult library, with its cheerful open fire during the winter months, it was not very long before its inadequacy was being felt. The Ormskirk library became the divisional headquarters for the surrounding district, including the libraries at Maghull, Rainford, Skelmersdale and Burscough, and a large number of library centres in the smaller villages. The problem became acute when, in 1948, the first of the mobile libraries began operating from the library, to serve an area of some 130 square miles of South-West Lancashire. 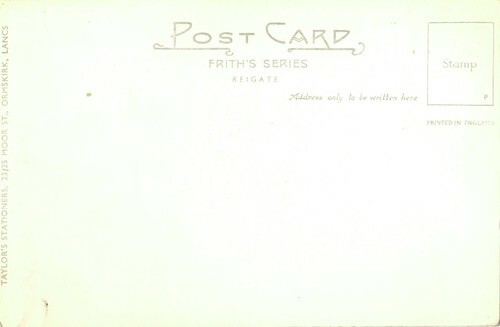 The facilities for the storage of books were almost non-existent, and the condition of the premises was such that books allowed to remain -on the store shelves for more than a few weeks mildewed or, at the least, became musty. The present library did not make its appearance without complaints from some Ormskirk residents, who felt, not without justification, that they should do all in their power to preserve the best of the old town, among which was included Knowles House. It was suggested that the facade and some proportion of the house should be retained and extensions added at the back of the house. Apart from the architectural difficulties, this conflicted with the functional requirements of a modern library and it was necessary to demolish this fine house which is preserved only in photographs in the possession of the library. The building which, in 1960 seemed to be the last word in library architecture, already appears dated, its air of solidity, both inside and outside, contrasts strangely with the lighter and less stolid libraries now being erected in the county. But despite occasional criticisms from the architectural standpoint, the consensus of opinion, particularly among newcomers to the town, is one of surprise that a relatively small town such as Ormskirk has so impressive a library. A visit to the present library, particularly on a busy Saturday, shows it to be not just a place for borrowing books, but a social rendezvous for all the family to visit and a workshop for the student, who possibly regrets occasionally that perfect silence is no longer possible or indeed desirable. 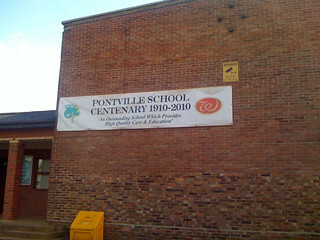 Edge Hill isn’t the only educational establishment in Ormskirk celebrating an anniversary this year – Pontville School on Black Moss Lane is 100 years old in 2010 – happy birthday! Continuing a series of posts from the Liverpool Daily Post’s Changing Face of Ormskirk supplement is this map of Ormskirk Town Centre showing plans for pedestrianisation. 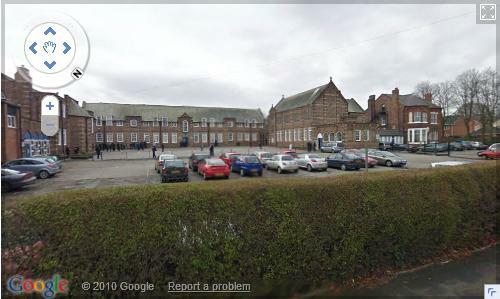 The problems facing Ormskirk are similar to those facing most towns large and small in this country – problems created and aggravated to a large degree by the motor vehicle. 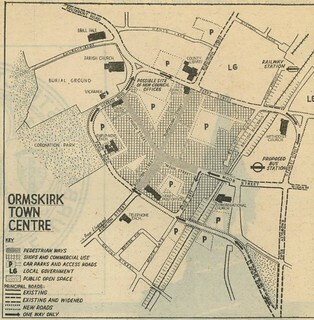 [T]he Ormskirk town centre control map was prepared in 1964. This plan endeavours to retain the character and atmosphere of the existing town whilst encouraging redevelopment and revitalisation of those parts of the central area which are less attractive or in danger of becoming rundown from a business point of view. The segregation of pedestrians and vehicles within the shopping centre. The article goes on to suggest some of the more outlandish ideas of the time including the M59 running from Bickerstaffe to Preston! 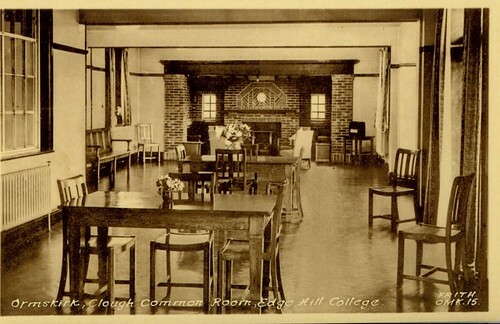 The second version of this postcard of Clough Hall Common Room was published for Taylor’s Stationers of Moor Street, Ormskirk – still there today! To Ireland; To Scotland; To London! It’s been far too long since we’ve had a decent post about maps! 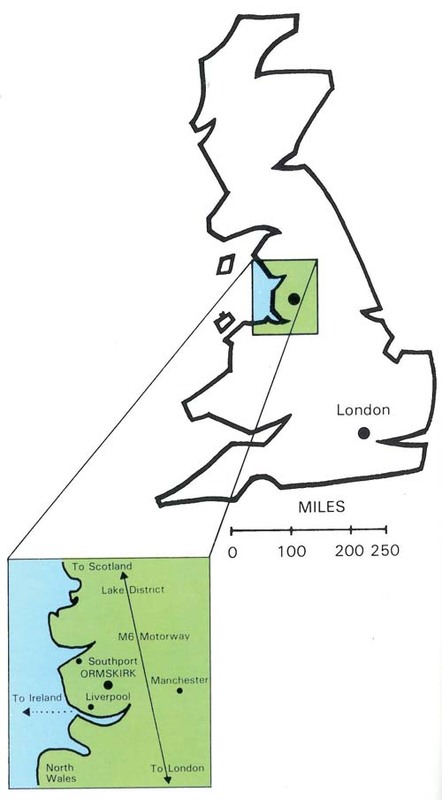 This one comes from the 1992 prospectus that described a region of contrasts and has all the quirky features we love to pick apart! Just the one road is present – the M6 showing how to get to Scotland and London but none of the other roads that might actually get you to Ormskirk. The ferry route to Ireland is a nice touch. The best bit, however, has to be the coastline. I appreciate the sand dunes at Formby may have changed significantly over the years but it appears to be drawn from memory or possibly to make the Mersey look like a smiling face! A very special guest map this week that doesn’t even feature Edge Hill. 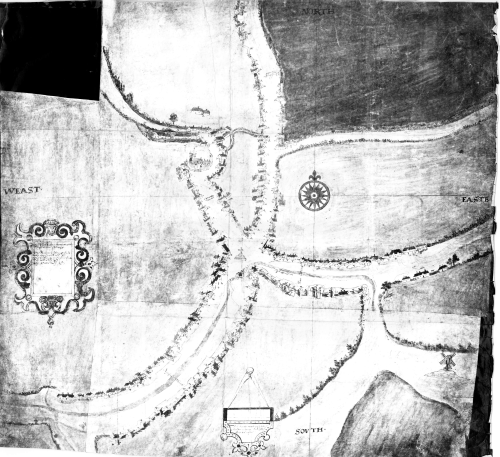 Above is a map of Ormskirk from 1609. 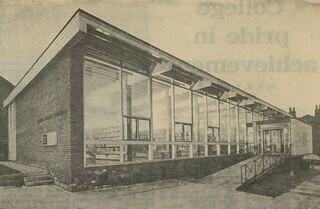 The original is held by Ormskirk Library and this scan is available on the Lancashire County Council website. This map explains why Aughton Street and Moor Street are much wider than the other two streets and predates by quite some time the clock tower which now stands at the cross roads. Ormskirk’s changed quite a lot over the last 401 years, and not just because of the University! 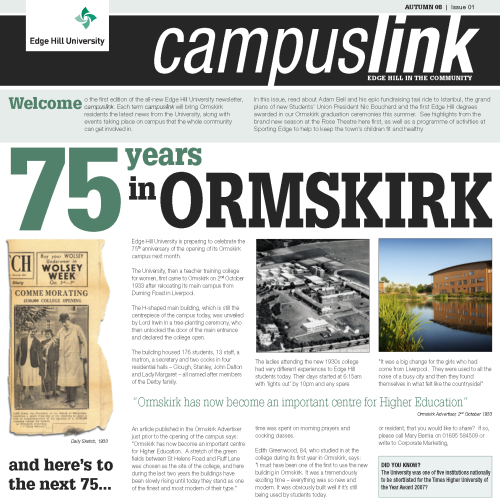 Edge Hill University is preparing to celebrate the 75th anniversary of the opening of its Ormskirk campus next month. 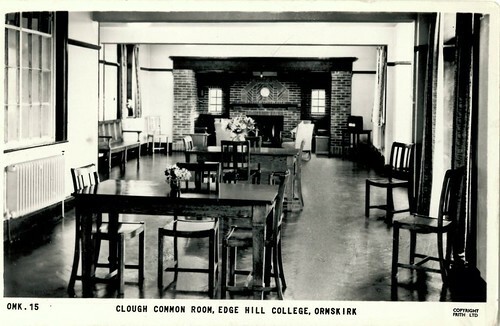 The University, then a teacher training college for women, first came to Ormskirk on 2nd October 1933 after relocating its main campus from Durning Road in Liverpool. The H-shaped main building, which is still the centrepiece of the campus today, was unveiled by Lord Irwin in a tree-planting ceremony, who then unlocked the door of the main entrance and declared the college open. The building housed 176 students, 13 staff, a matron, a secretary and two cooks in four residential halls – Clough, Stanley, John Dalton and Lady Margaret – all named after members of the Derby family. An article published in the Ormskirk Advertiser just prior to the opening of the campus says: "Ormskirk has now become an important centre for Higher Education. A stretch of the green fields between St Helens Road and Ruff Lane was chosen as the site of the college, and here during the last two years the buildings have been slowly rising until today they stand as one of the finest and most modern of their type." The ladies attending the new 1930s college had very different experiences to Edge Hill students today. Their days started at 6:15am with ‘lights out’ by 10pm and any spare time was spent on morning prayers and cooking classes. Edith Greenwood, 84, who studied in at the college during its first year in Ormskirk, says: "I must have been one of the first to use the new building in Ormskirk. 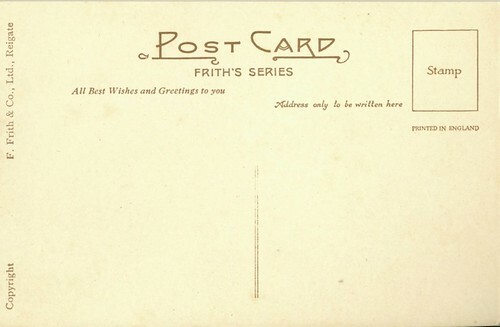 It was a tremendously exciting time – everything was so new and modern. It was obviously built well if it’s still being used by students today. "It was a big change for the girls who had come from Liverpool. They were used to all the noise of a busy city and then they found themselves in what felt like the countryside!" Time once again for my regular look into maps of Edge Hill and today we feature a map which is still in use. That means I have to be careful not to offend anyone by picking holes in its design and bizarre choices of locations, but fortunately that’s not a problem as I really like this set of maps. 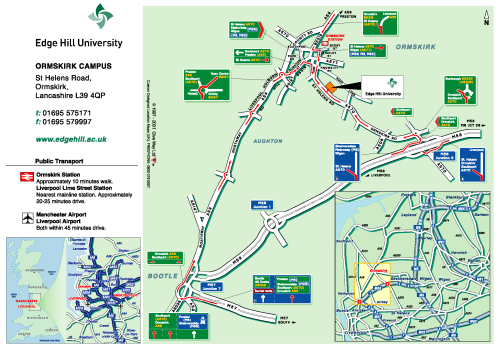 The one above shows directions to the Ormskirk campus but we have maps for most of Edge Hill’s other campuses too. They’re created by Give Way and show just the roads and junctions you’re likely to follow to get to your destinations, showing which way to go and even signposts to look out for. They’re simple yet packed full of extra information like contact details.